Is this judge worth 9 times the worth of poor old Joe Average (who — after all — pays all the bills)? Victoria B.C.’s Times Colonist says that B.C. pays its lower court judges “fairly” … $235,000 a year … but the judges want more!!!! I remember 1957 as well as it were yesterday. A superior court judge I knew made $15,000 per year. Average income was, according to Statistics Canada, $3,000 per year. In them days, a judge earned 5 times what Joe or Joselyn Average did. In 2016 B.C. Joe Average earns about $30,500 a year — a judge of the Superior Court of British Columbia earns $288,100 per year. The judge earns almost double what he did in 1957 in comparison to the Salt of the Earth. Well if the Queen in Right of Canada thinks a Justice (who should be bowed to and called M’Lord) should be paid $288,100 per year, what kind of a low budget disturber are you questioning the divine authority of Her Majesty. exactly what he meant and some of his language has to be left out of this family newspaper. If a lawyer was stretchin’ too far, The Chief usually called out B*** S*** in those very words — expletives included. In those days the judges were professionals. Trials now go on for weeks, months, years. Judges haven’t got the guts to turn off the over-info tap and shut lawyers and witnesses up. 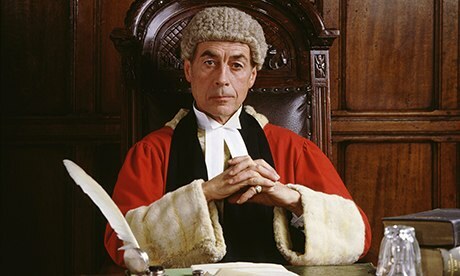 Before they were appointed, the judges of today were ‘umble as Uriah Heep when they were sucking up for an appointment but, once appointed, they and their spouses put on airs aplenty and expect to be treated like the Lord or Dowager of Downton Abbey — unless — of course — some korrectness kop thinks they’re being politically incorrect. And, a few years back, in Calgary, they tried to have a $1-billion building built for them so they’d be protected from Al Quaida and the mafia and the bogey man and the great unwashed. Even the Alberta Tories found that too rich. The judges of today are overpaid. I think they’re worth — at most — $50,000 a year — if they were brought down to the level of those who pay them, then they’d get a whiff of how the other 99% — the people who they’re judging — live. the Canadian dollar inflated 747.33 % between 1957 and 2016. According to Statistic Canada’s Revenue Calculator (http://www.statcan.gc.ca/tables-tableaux/sum-som/l01/cst01/famil105k-eng.htm), the Median Annual Income of B.C. Residents was $30,540 in 2013. The prosecutor had only three witnesses. If I was the judge, I’d have sent all three to jail. Feminists bullied the Attorney General of Ontario into prosecuting Jian Ghomeshi. A gutless prosecutor should have but didn’t refuse to prosecute. The prosecution’s only three witnesses perjured themselves. In any other criminal case — where the accused’s liberty is at stake — all three would have gone to jail. An Ontario judge acquitted Ghomeshi. Two University of Victoria law professors attacked the judge for being “insensitive to inequities in society and the nuances of human behaviour” because he didn’t conduct a Soviet-style show trial. The University and the Law Society displayed a Soviet-style lack of guts for not firing the professors.